On the heels of last week's disheartening news about the end of the United Kingdom's 10-year national play strategy, this story from Abu Dhabi may help revitalize any dwindling optimism about the state of play in the world. The city plans to open over 120 new playgrounds this year, as well as a dozen parks, with the ultimate goal of ensuring that every resident has a playground or park within 400 meters (about 437 yards) of their home. Ahmed al Muraikhi, Abu Dhabi's director of parks and recreation told The National, "We wanted to provide an escape for families and children and make safe parks within a reachable distance to all residential areas." As a nonprofit with a vision of a playground within walking distance of every child in America, we sometimes feel a bit daunted by the sheer enormity of what we have yet to accomplish. Abu Dhabi is not only acting on the same vision, but expects to achieve it within a year -- and we know that's no small feat! 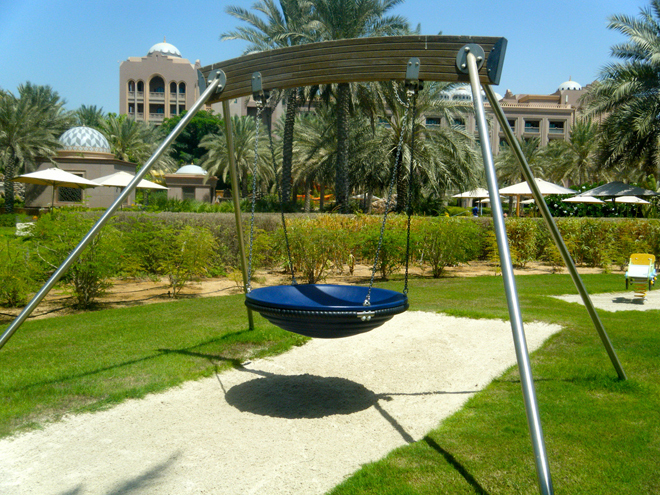 A playground outside of Emirates Palace in Abu Dhabi. Photo by Sarah Ackerman (cc). Learn more about Abu Dhabi's aggressive playground-building plan.